Tony Thorpe (The Moody Boyz) has been a very busy boy of late: playing gigs all over the place including Dublime at Fabric and Glastonbury, putting together The Dubstep Chronicles for Massive Attack's Meltdown festival, remixing for the likes of Lee Scratch Perry, Erykah Badu and Roots Manuva and of course searching the world for cutting edge dubstep for his label Studio Rockers. In his 'spare time' he has managed to finish his first slab of solo vinyl in years that he's 100% happy with, lucky us! 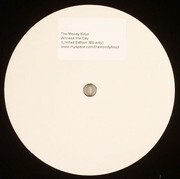 Witness The Day is only available on limited, one sided, white label vinyl. Mr Thorpe has thrown one of his usual moody fits and has sworn that all the metal plates, laquers, masters etc. for this release are going up in smoke, the track will never be available again; you have been warned!